Do you ever wonder if God really does have a plan for your life? Maybe you thought that God had a plan once, but it’s been so long that you are sure now that you were mistaken. Isaiah 44:24-28 tells us that God had a plan to release the people of Israel from exile in Babylon, and that it would be fulfilled by Cyrus, King of Persia, who would not be born until more than a hundred years later. Isaiah 45:2-3 records God’s words to Cyrus. God assures Cyrus that He will make his path clear and remove all the obstacles that get in his way. God will provide Cyrus with treasures that are currently hidden away. In the context in which this passage was written, these words were meant literally. The Israelites would need someone to overcome all of these obstacles to rescue them from captivity, and there really were treasures that had been hidden away, typically in subterranean places. History books will tell you that Cyrus came away from his conquests with many thousands of pounds of gold and silver. I think that we, however, can look at this passage figuratively. Although we will all face obstacles if we are following God’s plan for our lives, we can trust Him to clear the way for us. Look back at Isaiah 44:24; our God has the power to accomplish His plans. It doesn’t depend on our strength or ability. But that doesn’t mean that our days will always be easy. There will still be hurts, and things will probably take longer than we want them to. In many translations Isaiah 45:3 says, “I will give you the treasures of darkness…”. That has always symbolized for me that even in the darkest, hardest times of our lives, we will find blessing. That is the treasure. Through those hard times is when we will turn to God, and we will learn to rely on Him. We will learn that God is God, and that He calls us by name. No matter what we have to go through, God has the power to get us through it, and He loves us. What a source of hope that is! Isaiah 55:8-9 What’s the plan? Author LCPublished on May 18, 2011 Leave a comment on Isaiah 55:8-9 What’s the plan? I have said many times in my blog posts that God has a plan for our lives. Many verses in the Bible confirm this. Jeremiah 29:11 tells us that His plans are to prosper us and not to harm us; they are to give us a future and a hope. John 10:10 says that Jesus came to give us abundant life. Ephesians 3:20 promises more than we could ask or imagine. Philippians 4:19 tells us that our needs will be supplied according to His glorious riches. So, God’s plan for us is a good plan, but that doesn’t mean that it will be one that we understand. I have often tried to figure out God’s plan for my life, and then tried to make it happen. Although I think it is a wise thing to obey God’s Word, and to try to live a life that is pleasing to Him, trying to figure out His plans can be an exercise in frustration. Isaiah 55:8-9 tells us that His plans are not like our plans, and His deeds are not like our deeds. Just as the sky is higher than the earth, so are His ways higher than ours. They are beyond our comprehension because He is God, and we are not. What we need to do is to give ourselves over to Him. Ask Him to lead us in the path that He wants for us, and trust Him to keep His promises. Earlier in Isaiah 55, we are invited to come to God to receive His blessing without cost. This is referring to salvation and the promise of eternal blessings, but by giving our lives over to Him we can also depend on all of the other promises of an abundant life now. He really does have a better plan for our lives than we could make for ourselves. It won’t necessarily be easier, but it will be better, and it will be for eternity. Published on May 18, 2011 Categories God's Power, TrustTags blessing, hope, Isaiah, planLeave a comment on Isaiah 55:8-9 What’s the plan? Friends of mine recently had a blessing party for their sixteen year old daughter. I have heard of people blessing their children before, at certain milestones in their lives, but this is the first I’ve heard of a blessing party. I think it’s great. At this party, friends and family came prepared with a letter of blessing that was read aloud and then given to the person being blessed, so that she could re-read them in the days to come. The letters would include words of acknowledgement, encouragement, wisdom, advice and the Word of God. 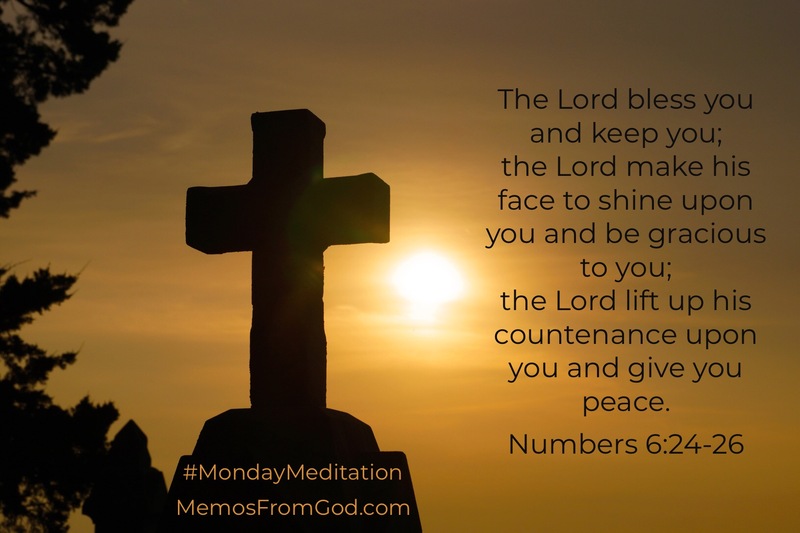 In Numbers 6:22-27, God instructed the priests to bless the people, and God provided the words of the blessing, so that the people would know that it was from Him. This passage follows a description of Nazirite laws and dedication which involved adherence to several rules that they would follow in order to separate themselves from the world and devote themselves to God. But the blessing in Numbers 6:24-26 was not only given to the Nazirites as a reward for their sacrifice; it was given to all of the people. The word “you” is singular in the Hebrew indicating that it applied to each individual. God wants to bless each of His people, not because of their devotion to Him, but because of His great mercy and love. Many people seem to think that people lived under the law in the Old Testament, and grace was not given until the time of the New Testament. Although laws were given to the people to live by in Old Testament times, this did not indicate a lack of God’s love. This passage tells us that God wanted His people to be blessed, protected and recipients of His acceptance, grace and peace. In that time, it was not usual for a monarch to give audience to just anyone, but by shining His face upon you, the King of Kings welcomes you into His presence. He wants to bless you, so that you may be a blessing to others. Freely you have received; freely give. (Genesis 12:1-3, Matthew 10:8b) Take the time to bless your children, your grandchildren, your friends and your family.